Stripping indigenous peoples of their lands is so frequent in history, it is almost routine. Today’s colonists are much the same as their 17th-century counterparts. All that has changed are the tactics they use to conquer. Battles once waged with weapons now come in the form of targeted environmental degradation and systematic land grabs. We are still living colonialism’s violent history, this time in the territory of the Wet’suwet’en, a First Nation people in central British Columbia. The company TransCanada, which also constructed the Keystone XL pipeline, intends to build another pipeline through Wet’suwet’en lands. Considering TransCanada’s history, and the track records with other pipelines, there’s no guarantee it won’t leak. The environmental devastation of leaking oil cannot be understated. Oil is highly toxic to both plants and animals, and can persist in an environment for as long as 30 years after the initial leak. Oil spill exposure for humans can lead to abnormalities in cardiac and respiratory function as well as neurological problems. The hereditary chiefs of the Wet’suwet’en clans challenged the validity of the project permits, claiming the Canadian National Energy Board (CNEB) had no authority to approve the project without their consent. The CNEB denied their request. Following the example of protests at Keystone XL and the Dakota Access Pipelines, demonstrators put themselves on the line in opposition to the construction. Two roadblocks were erected on the path of the slated construction site. One of these roadblocks has been there since 2009, first placed by the Wet’suwet’en in response to multiple planned pipelines. Protests have also swarmed Canadian streets. The elected band councils of the Wet’suwet’en, however, endorsed the Coastal GasLink project, prompting some to argue there is nothing unfair at play. Yes, the Wet’suwet’en band councils and TransCanada made a deal. The band councils, however, were not negotiating from an equal position of power. Many of the clans within the Wet’suwet’en nation are impoverished, with homes being shared between as many as three or four families. Some clans did not have running water in their homes until as recently as 10 years ago. Poverty is no accident. It is the consequence of economic, geographic and political marginalization of indigenous peoples at the hands of colonial forces. It is no shock that people who had their most resource-rich lands taken from them find themselves locked in a cycle of poverty centuries later. The tribe’s decision to allow the pipeline was a dire bargain for access to basic needs. 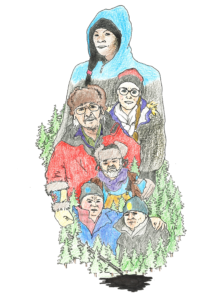 In exchange for access to education and care for seniors, the Wet’suwet’en parted with their ancestral lands. “The people who are concerned about our decision, they should come to the reserve and live in these conditions themselves and then have to weigh in on a decision like that,” said Wet’suwet’en member Joseph Skin to HuffPost. The poverty grasping indigenous communities is violence in slow motion. Although indigenous peoples make up 5 percent of the global population, they account for 15 percent of the world’s poor. In effect, today’s economic pressure isn’t far off from the point of a gun. Indigenous people are deprived of their land all the same. The violence is also physical. The Royal Canadian Mounted Police (RCMP) made 14 arrests at a roadblock near the site of the pipeline after Canadian courts issued an order for the block to be cleared. The RCMP’s actions drew an outcry from protesters leveling accusations of excessive force. This echoes militaristic force police showed protesters of the Keystone XL pipeline. There at Standing Rock, law enforcement subdued demonstrators with rubber bullets and tear gas and sprayed them with fire hoses in the freezing North Dakota winter. We must lend our voices to this struggle, and raise awareness so the masses rise against it. There is nothing voluntary about the deal made between the Wet’suwet’en and TransCanada, a deal made under the pressure of economic desperation. If you’re able, find a way to support demonstrators on the front lines. Send supplies, or even travel there yourself. Be it Coastal GasLink, Keystone XL or the Dakota Access Pipeline, this cycle of environmental and economic brutality cannot be allowed.